I am looking at a range of options to decide whether I pursue film or drawing as my second year of RPT. At present I have reviewed all of the sources that I have found over the past two years. 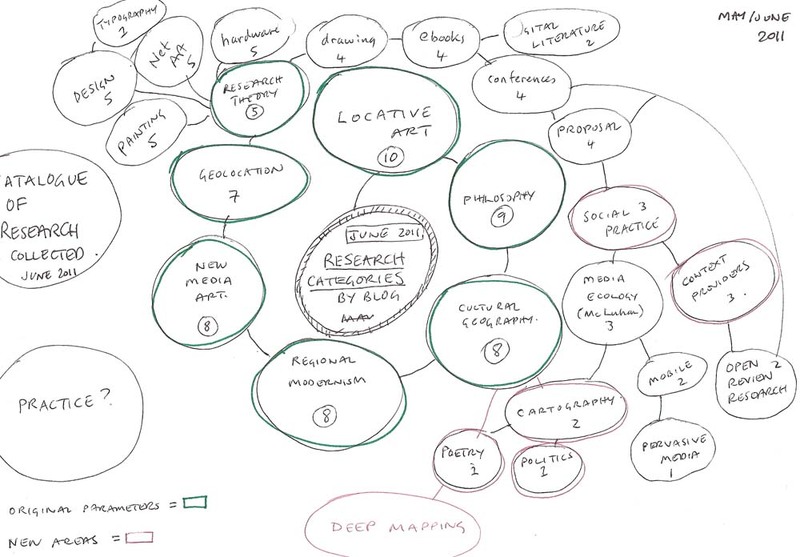 The illustration below shows the strongest categories in my original research blog in 2010 and 11. Looking at the spider diagram one can see how the original parameters changed as I went through the year. The above diagram does not include any references to non-multimedia i.e. Drawing related practice as at this point I was keeping this separate. I began with a fairly tight proposal focused narrowly upon using the then new tablets and possibly applications running on tablets which used a narrow geographical location as its subject matter. As I progressed through the year and investigated the area more deeply I found myself moving away from the original proposal. My original idea of using GPS within a hand held application was quickly undermined by a rapid development of several freely available apps which operated very similarly to my original concept. These included the Spanish paint map use of Google maps API and the Brothers and Sisters ‘Street Museum’ for the Museum of London.Since then the History Pin android app pretty much does what I was hoping to prototype. I also looked carefully at the category of Locative drawing. This seemed to me to be a fairly shallow theoretical area which had been explored thoroughly and had produced a range of outcomes from the banal to the quite good. At this point I seemed to be drawn most to Richard Coyne’s theory of ‘Tuning of Place’ and the ‘multimedia work of Martin Reiser. Having a year break has reinforced the turn away from this original idea as both hardware and software developments have moved on a pace. My first actions on location on the actual disused railway track involved photographing places along it. In the course of this I met a local photographer and historian who is very active in documenting this particular location. This led me to investigate the then new concept of context provision and to consider placing my practice within a social practice container. Once again I felt that this categorisation did not really reflect my aims. There are elements of my practice as a web practitioner which could be seen as context provision. However, advice for me, sale this was not an area I wished to develop at this point. Having decided that my research project should produce quantifiable research and physical artefacts as outcomes I reconsidered my position and turned to photography/film as a more solid theoretical base and area to explore. This was reinforced by the wider availability of DSLR HD cameras as well as the increasing potential of mobile phones to shoot video footage. Two photography mentors suggested that I focus on producing manageable outcomes in a variety of media. I also discussed with them the concept of deep mapping and especially the work of Cliff McLucas and Mike Pearson in regard to performance mixed with graphical elements and video. This for me, all linked directly to the work of Patrick Keiller especially in his recent ‘Robinson in Ruins’ film. 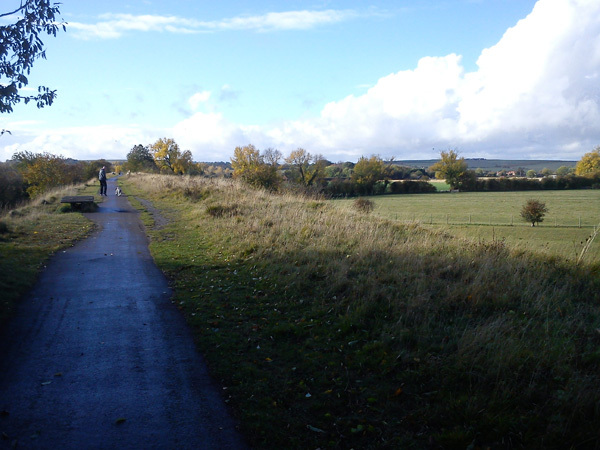 At this point (November 2011) I had taken several photos on location and voiceover films via mobile phone incorporating local history/natural observation/political commentary live as I was walking along the track. This correlates with a lot of contemporary theory and practice in terms of both Locative and dialogue related practice. Some of this practice appears to me to be weak if not founded on a thorough knowledge of the area being traversed. I bring to my practice knowledge gained over 25 years of researching and writing poetry informed by local history and natural observation. This enabled me to ad lib continuously over handheld film for 40 minutes. This was very experimental and obviously is not tightly scripted nor well edited material. Indeed the very amateurish and ad-hoc nature of the performance as recorded is a necessary part of the experimentation and the final output. I however cannot directly link this portfolio to this area. 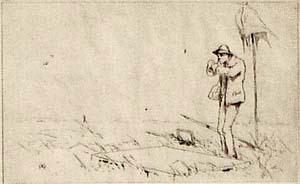 Others sketches by Alexander Mann do correlate with the location. These drawings appear to relate to a Scottish landscape particularly in their subject matter i.e. Gnats being actually Scottish midges! Mann is not the only artist who relates directly from the historical point of view to the track I was walking. I went into some depth in locating various individuals as they linked to my own practice in the early 1990s. I have found one Mann easel painting which appears to be the same view I drew some 90 years later. However as with previous research diversions this material takes me very far away from the original premise of the research project. At present I have put this particular research on hold until I can find a way of reintegrating with the notion of multimedia. Returning to the idea of multimedia and leaving the historical aspect for while I re-examined the material shot on the Sony Xperia Mini mobile phone. This is low quality footage gathered by holding the phone in front of my face and speaking as walking. This enabled me to produce a voice-over in the manner of Patrick Keiller not with a far more personal focus. I have also experimented with this footage by stripping out the frames using free software and then moving through the sequence by hand and using screen capture software to produce a fake’ film’. The results I have posted to my vimeo website. My interest here relates to the Solnit and Schivelbusch concepts of film and railway time being linked. In my case I am slowing down the film manually to create ‘walking time’ as my viewpoint is that of the walker not of the railway carriage occupant. This can be seen to link to Darren Almonds contemporary work with film and trains. I also see it as linking to Philippe Parreno’s reconstruction of the funeral train journey of Robert Kennedy’s body only in my case I am deconstructing the view from the train completely and replacing it with a walk thus reversing the technological advance which aligns with the physical deconstruction of an arterial route. This particular line reveals a post imperial contraction as commerce and goods ceased to flow through the traditional ports such as Southampton. Thus this in a greater sense reveals the nature of Britain as a post imperial, service led rather than manufacturing economy. My political comments came about through voiceover as a natural addendum to the film. As I have stated this was not scripted or planned. In this regard that commentary links directly to my work in poetry. This project has been directly influenced by a sense of loss. My father died in 2004 from cancer and my mother suffered from carcinoid cancer in the period 2005 to 2012 and died on the 8th June 2012. My focus on the track was done in the full knowledge that I would be visiting the area regularly and that this would be the last time I could focus on it fully. I intend through the summer of 2012 to complete a series of short films with no dialogue related to their loss. I also intend to create more artefacts out of my engagement with the track itself. Whether or not this will be shown or included as part of my final M.A. RPT multimedia summation depends upon the direction I choose from September 2012 onwards. This I will decide in due course. This document acts as a summing up of the various directions my research has taken over the past two years including the year of leave of absence. It is intended to clarify these tentative investigations both for myself and any potential supervisors. MANN, Alexander. 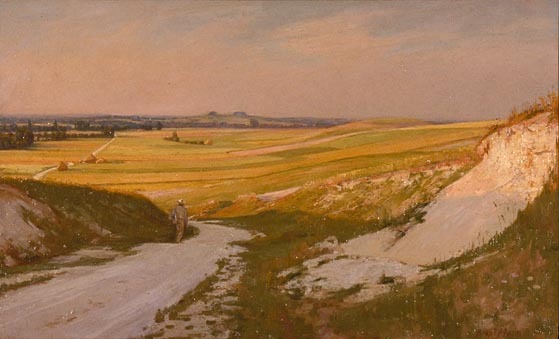 GNATS AND OTHER HINDRANCES TO THE SUCCESSFUL ACCOMPLISHMENT OF LANDSCAPE PAINTING. London: Fine Art Society, 1884. Oblong folio. A special publisher’s Presentation Binding in full pigskin. x pages, etched title page and 16 etched plates, each in two states, with a third state of 10 plates also present. Number 9 of 250 copies of the large-paper issue. A nice association copy, owned by James Mann, the artist’s father, with his bookplate. The book also bears the bookplate of the flamboyant architect and historian, Roderick Gradidge. Alexander Mann was a Glasgow-born, Paris-trained artist. 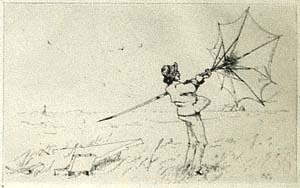 This suite of delicate comic etchings depict the trevails of the poor landscape painter who must deal with rain, insects, cumbersome easels and umbrellas. This copy is in a full pigskin binding by Maclehose of Glasgow, most probably designed by the artist. The copy contains two states of all etchings and a third state of ten of them. The first state of Plate VIII is on inferior paper and is slightly spotted, else a very good copy with very minor edge marks. OCLC lists two copies of what appears to be the regular edition with seventeen etchings only. Those are at Cambridge and the British Library. No copies are cited as being in American libraries and we could find none selling at auction during the past twenty-five years.